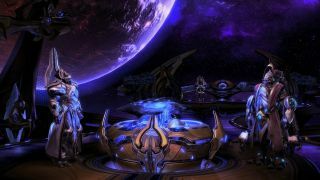 We told you it was happening, and happened it has: Blizzard has revealed the release date of the long-awaited third and final chapter of StarCraft 2. Legacy of the Void will be out November 10, as announced just now, shortly before the start of the StarCraft 2 WCS (World Championship Series) Season 3 Finals. After a few technical issues, and an excruciating, waffly preamble, Blizzard also showcased the game's reliably beautiful opening cinematic, which you can find above. If you can't wait until November, know that Void's prologue missions—collectively titled Whispers of Oblivion, like a bad heavy metal album—are out now. Sean Sands went hands-on with LotV back in April, and left moderately impressed.